With more than half of the PCs in the world more now five years or older, Intel says that this is the time to upgrade to a new desktop, laptop or tablet. At IFA 2015, Intel officially took the wraps off of its sixth generation processor, known as Skylake, and the company is packing in the performance to tempt owners of older laptops to upgrade. So how does Skylake compare to CPUs running on systems from five years ago? "Skylake delivers 2.5 times faster compute performance, 30 times better graphics and three times the battery life," said Kirk Skaugen, Senior Vice President and General Manager of Intel's Client Computing Group. 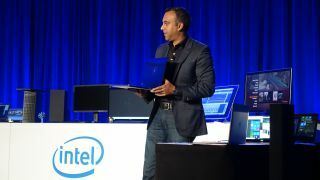 Compared to laptops from just five years ago, Skylake will have four times faster wake-up times, said Navin Shenoy, Intel Corporate VP and General Manager of Mobility Client Platforms. There are over a billion PCs that are over three years old, and that's the market that Skaugen and his team are targeting with Skylake. On mobile, Skylake is a highly scalable architecture, said Schlomit Weiss, VP of Intel's Platform Engineering Group. The architecture can work on 4.5W on tablets running Core M processors to 45W on more advanced laptops, Ultrabooks and mobile workstations. Additionally, Skylake is also found on desktops. There are three different families of mobile architectures in Skylake's architecture family, with each successive series consuming more power and delivering better performance. The Y-Series is a 4.5W processor that's more commonly known as Intel Core M. This model is found in light laptops, tablets and 2-in-1 systems. The next model is the U-Series, which are the Intel Core i processors used on Ultrabooks. These processors consume just 15W of power. And finally, the more powerful Core i processors used on mobile workstations are found in Intel's H-Series family, which are 45W processors. These processors are the most efficient that Intel has ever created, Shenoy boasted in a meeting ahead of IFA 2015, stating that Core processors on Skylake use up to 60% and are up to 60% faster compared with a Haswell processor from two years ago. In fact, the processors are eight times more efficient than Intel's best from five years ago, leading to two times better processor performance at just a quarter of the thermal power. Haswell was succeeded by Broadwell, and Skylake is the followup to Broadwell. In addition to the Skylake family designed for laptops and tablets, Intel also has the H-Series for desktops. On desktops, Skylake provides a 10% boost in processor performance and 20% increase in graphics performance compared to Broadwell, said Gregory Bryant, Corporate VP and General Manager of Intel's Client Computing Group Desktop Client Platforms. In addition to processing improvements, the integrated Intel HD 500 graphics also got a boost with Skylake. The Intel HD 500 graphics will let you watch up to ten hours of HD video on a single battery charge. You can also create content, with up to 20% faster 4K video encoding. For those looking to consume 4K video, Intel HD 500 graphics can drive up to three displays showing 4K videos at 60 frames per second. Gamers will appreciate the 40% better performance when it comes to 3D rendering. Intel's more advanced graphics, known as Intel Iris, will finally be available on 15W U-Series graphics. Previously, it was available on the H-Series on laptops, and Iris has been a staple on Apple's MacBook Pro series. Iris will deliver even better performance on Skylake thanks to integrated eDRAM. Systems with Iris graphics won't ship until later this year, and Intel says that Iris Pro will arrive in 2016. Currently, the most mainstream notebook that uses Iris Pro is Apple's 15-inch MacBook Pro. With Intel's timeline, this could mean we won't see a MacBook Pro refresh until 2016 at the earliest. The biggest news when it comes to graphics, Skaugen claims, is that Iris can deliver up to 80% of the performance of the discrete graphics chips on the market today, which is a significant performance improvement. In fact, Iris on Skylake delivers up to 100 times the graphics performance compared to just a decade ago. "Intel is going from predictable to incredible," Shenoy said. These graphics gains may be enough to force Apple to re-think the use of dedicated GPUs on its MacBook Pros, two Intel insiders told techradar.